Nice people with bad workers. Brought my truck ( 2016 ram 1500 )to have my vandalized roof fix, they fixed it but ending up scratching my door panels ( probably from a workers clothing) and also leaving white hand markings inside my truck. luckily my wife notice it before we leave the lot and have it pointed out to them and set up another date to have it fix. brought it back again to have it fix. but before i went to their shop. I went to a drive thru carwash to have it clean so they can see the scratches really well. Yes they fixed it, but handing it back to me without washing it. I even pointed it out to victor and he told me to wait so he can have it washed, but i declined it. thinking that it may result to another problem.I know he is a nice guy, he even drop me off at a doctors appointment on his maserati. Nice people but with workers with no attention to deatails and poor worksmanship quality. Great new facility and location and the same service as expected from Victor. Our claim was in and out in less than 2 days. Friendly professional service for the repairs of a corner bumper scuff due to a careless ditchmond driver trying to park next to us in the parking lot. Thank goodness for multi-view dash-cams that recorded the event. Other inexperienced driver even claimed afterwards they hit nothing and had no body damage on their MB.....other than some nice fresh one-sided oem pin-stripes along their passenger side rear wheel well/ quarter panel. Thanks for the great service and turn-around time Victor. I would highly recommend Grand Performance auto. The workmanship is good and they do their best to please their clients. Theyre honest and take the time to speak with their clients even though theyre very busy. My vehicle was damaged while it was parked and they processed the ICBC assessment and repair with ease. They also fixed two other small items for free, which was much appreciated. Another bonus is that they speak both Chinese and English fluently, which is sometimes hard to come by in Richmond. Kind people with Really Bad service. Trust me, this store should be your last choice in Richmond to delivery car related services. They dont care about your car at all. Sometimes I even feel like I am the business owner and they are customers.. Highly recommend! Had a rear-end accident few months ago and brought my car in, they started working on it the same day and called me to pick it up in 2 days! The back bumper looks like brand new :) Very honest people and excellent job! 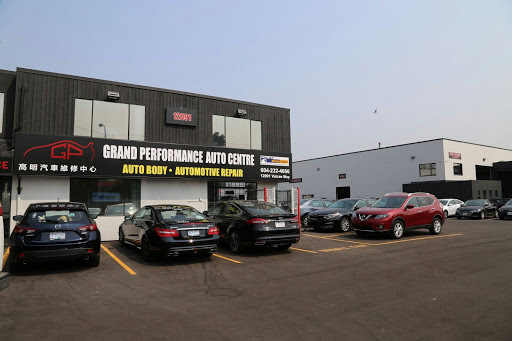 I use Grand Performance Auto for all of my auto maintenance needs (other than tires). Always have a good experience, honest and share the process when there is an issue with the vehicle. Great service. Replaced my damaged parts the next day after I gave them my ICBC claim info. Will be back again.